Is Ontario Considering New Forms of Sectoral Collective Bargaining? protective work laws are largely ineffective at securing decent working conditions. Employment standards laws are not effectively enforced, assuming that the workers are not excluded altogether by a plethora of sometimes inexplicable exclusions found in the ESA and its Regulations (see my post on exclusions). And hardly any of these workers have effective access to collective bargaining under the Labour Relations Act. In the consultations for the CWR, most of the focus has been on reforms to the ESA. Less attention has been directed at the Labour Relations Act, other than from the unions. Employers have offered basically nothing of substance to the discussion about how the Labour Relations Act could be reformed to help Ontario’s most vulnerable workers who have been out of reach of collective bargaining. If you don’t believe me, spend some time reading submissions to the CWR from employer groups. Employers have basically argued that everything is just fine, although it would be good if the law was reformed to give employers even greater rights to resist efforts by the employees to join unions. 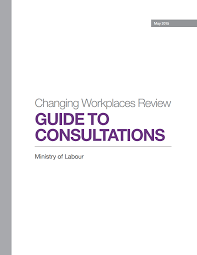 For example, the Human Resources Professionals Association submissions on labour law reform consists of a recommendation to “ease restrictions on what employers can say to employees when they are considering unionization”. Employers can already express whatever opinion they like about unions as long as they don’t intimate, threaten, coerce, or make promises to reward employees if they reject collective bargaining. So I guess the HRPA wants employers to be able to intimate, threaten, and coerce? Hard to see how that will address any concern about helping vulnerable workers. The CWR special advisors have been asked to consider how the LRA could be reformed to extend collective voice or collective bargaining to the millions of workers who do not work in standard full-time jobs at large factories. For example, unionization levels in the retail sector in Canada are around 15-16%. The fact that about 85% of retail workers are non-union is not explained by a lack of interest in unions by those workers, as I have discussed in the past. The fact is that even when those workers want collective bargaining, the legal model as presently constructed makes it extremely unlikely that they will ever get it. A giant corporation that operates through dozens of small stores, franchises, or branches is mostly impenetrable for unions under existing laws, which were designed to facilitate collective bargaining in giant car plants, steel mills, and mines. If 800 auto workers strike at a plant in Oshawa, the employer will have good reason to reach a deal. A different dynamic plays out at the banks, coffee shops, and fast food and retail chains. Even if unions can locate the army of constantly changing part-time workers and get them to join the union, a strike against one store within a giant conglomerate will almost certainly fail because the corporation can withstand that work stoppage. If the union is dealing with a franchisee, then the party with much of the power and control (the franchisor) is a phantom bargaining party. The franchisor is not technically at the bargaining table, but the terms of the franchise agreement leave the employer with little room to move through collective bargaining. 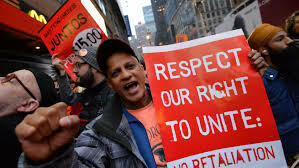 The only way that unions can make headway in these sectors is if they can somehow conduct bargaining at one time for a large number of stores so that they have sufficient power to bring the employers to the table to bargain seriously. Obviously employers are determined to not let that happen. This is the background within which the CWR is considering alternatives to the typical Wagner model of collective bargaining. Don’t expect a fundamental reworking of that model, which still works pretty well in those large workplaces where it was originally designed to apply. However, the CWR is exploring alternative models that could provide some collective voice to those sectors of the economy who are beyond the reach of the typical Wagner model. One potential model being discussed a lot in labour law circles was originally proposed in 1992 by a similar panel of experts in British Columbia (lawyers John Baigent, Vince Ready, and Tom Roper). The employer rep (Roper) did not endorse the model, and the model was not enacted by the B.C. government. This alternative sectoral bargaining model would only be available in “historically underrepresented sectors“, defined as sectors where union density is “significantly lower” than the union density level for all industries in B.C.. It would also only apply to workplaces where the average number of full-time employees (or part-time employees whose hours combined work out to the equivalent of a full-time worker) is less than 50. How would unions obtain sectoral bargaining rights? A sector would have two defining characteristics: a geographic scope and type of work involving “similar tasks”. So for example if this was applied in Ontario, you could have a sector such as “employees working in fast food in the City of Toronto”. There would be questions for the labour board to sort out, such as how narrow the tasks can be divided. Can a sector be “employees working in coffee shops” or “employees working women’s apparel”? Once a historically underrepresented sector is identified, then any union that can obtain at least 45% support majority support at two or more employers in that sector can apply for a sectoral certification. The union would have to win a vote at each location as well as win a majority of all employees combined. If the union is successful, it would obtain a sectoral certification. How would collective bargaining work? If a union is certified for a sectoral unit, it would then commence bargaining with all employers whose employees have been certified. For example, if the UFCW obtained a sectoral certification for “fast food workers in Toronto” and it was certified at one McDonalds store and one Burger King, then UFCW would bargain with representatives from McDonalds and BK towards reaching a standard collective agreement that would apply to both employers. If UFCW then later organized workers at more stores of those employers, or at stores of other employers in that sector, the new stores (and new employers if any) would be swept into the existing collective agreement, although the law would provide the labour board with flexibility to order alterations to the existing agreement or to open up the agreement for new collective bargaining. The new employers would be able to participate in the next round of collective bargaining. Under the proposed BC model, any union can apply to represent workers within a designated sector. So for example, the UFCW might represent workers at 6 different fast food restaurants in Toronto, with three different employers. The Steelworkers Union might then move into the sector and organize a a few McDonalds and Subways and bargain a collective agreement for those employers. Both the Steelworkers and UFCW would have their own collective agreements within the sector. According the authors of the B.C. proposals, this “would ensure that unions who are certified within a sector are not granted a monopoly on representations rights while offering employees the option of choosing from more than one union.” The normal rules of collective bargaining would apply, including the rules regulating the right to strike. The model could in theory produce fast food strikes across employers similar to what we have witnessed recently in the United States. According to the authors, “the issue respecting sectoral bargaining is whether certification procedures should be modified so that collective bargaining is a real option for people working in small workplaces.” They believed the law should ensure access to bargaining along the lines they propose unless “doing so would impose unacceptable restrictions on the rights of others”. Because in their proposed model a collective agreement would only be extended to a workplace if a majority of employees vote for that, the restrictions imposed on others are minimal. Employers would be able to participate in the negotiations of the agreements. A benefit of the model, beyond extending collective bargaining to historically underrepresented sectors, is that it could over time create a common floor of working conditions. This model of sectoral collective bargaining would introduce a dramatic new twist that employers in the sectors affected are certain to oppose. But employers will oppose any attempt to extend collective bargaining to sectors where it has been absent. If the government is not prepared to reform the law in any way that will offend employers who prefer to remain non-union, then what’s the point of the CWR in the first place? Simply tweaking with the existing OLRA will not achieve the government’s stated objective of expanding collective voice to workers who now have no access to it. Of course there are other models available, and I will discuss some in future posts. However, this BC model has been proposed by several unions in their submissions to the CWR. What do you think of the model? Would it lead to greater unionization of the service sector? Would this be a good thing? Can you imagine the Liberals experimenting with a sectoral collective bargaining model? I believe something has to be done as the retail and service sectors have been inpenetrable for unions. There are exceptions (retail food, for example)but these were the result of organizing drives that happened some 40 to 50 years ago. With the passage of Bill 40 in 1992, unions were able to consolidate bargaining units. This happened with the 12 Zellers stores the UFCW organized. However, this was taken away (retroactively) by the Harris Tories in 1995. There are examples of a modified type of sectoral organizing and bargaining in the building services industry. I think it has worked in that sector because unions were able to reach a critical mass in organizing after Bill 40 and cleaning contractors can use collective bargaining to establish predictability in their labour costs when they bid on work. In any event, it will certainly be interesting to see what is being proposed.